Today our blog post comes from Aparna Asthana, a Suzuki mom and dedicated parent. Her son Rohan, who was born prematurely, struggled early on with speech and with fine motor skills. Aparna writes about her drive to teach Rohan the violin, their long struggle with the Suzuki method, and Rohan's eventual delight in making music. What I love about Aparna's entry is its emotional articulateness: it's not just about the violin or Suzuki lessons or overcoming obstacles -- it's about how we can be surprised by joy. If you'd like to contribute to our blog -- as a Suzuki parent, music teacher, or string musician -- email me at joec@sharmusic.com. The year my son turned three we finally heard his voice, short staccato phrases that demanded juice or a toy. We sighed with relief. In preschool, he struggled with grasping a crayon, manipulating objects and cutting with scissors. In kindergarten, he finally learned to write his name; a claw-like grip on the pencil, letters written in reverse and scrawled unevenly all over the page. In music class, he shook egg maracas while other children poked small keyboards and learned to play some rendition of "Twinkle, Twinkle Little Star." He never really sang the preschool songs other kids sang; he watched them in solemn wonder and mute silence. And though we tried many times during kindergarten, he never learned to tie his shoelaces. He loved sound and vibrations. I knew because he stuck his head in the speaker with the bass pumping out a beat and shook his head from side to side. He banged on metal pots with forks and loved the clanging noise, occasionally stopping the humming vibration with his hand before starting again. He loved listening to music, any kind of music. But he never asked to play the violin. That he struggled with the kind of tasks other children took for granted was amply clear. What was not clear to me was why I thought it would be a logical idea to put a violin in the hands of a child who could barely write his name. I am not sure why, 5 years later, given his kindergarten teacher’s raised eyebrows, I signed us up for Suzuki violin lessons at the local Suzuki school. Perhaps I was tired of hearing about all the things he struggled to do. Perhaps the confident philosophy of Suzuki, with its premise that all children can learn and learn well, was what I needed to hear to bolster my sagging spirits. I needed to hear that my son could succeed at something, anything other than his ability to color well inside the lines. Dr. Suzuki promised that talent was not inborn but something created through work and patience and love. We needed to hear that as a family. I explained to his new teacher that my son had trouble focusing and that he struggled with fine motor skills. She was unfazed. She handed me a CD of violin music and told me to play it multiple times. She said she would see us the following week with a foot chart and box violin. I was doubtful but didn’t want to question her confidence. I did what I was told to do; I hit play on the CD on the ride home. I didn’t know this at the time but I had now committed our family to listening to "Twinkle" variations even in our sleep. That year, and the year after, the Suzuki Book 1 Violin CD played as a background anthem to our lives. It was there on the way to school; "Allegro’s" staccato beats played as my children kicked their seats and tantrummed their way through traffic lights. "Happy Farmer" played while we cooked and ate and argued; the "Bach Minuets" sang while we laughed and smiled and cried. During those early days of muddling through, Suzuki music was the only constant even when practicing was not. My son stalled many violin practices with a need to document and scratch every mosquito bite. He flat out refused to sing “Up like a Rocket, Down like the Rain.” He didn’t like to sing, he said. When I sang he rarely landed with a curved pinky or thumb. He sometimes dropped to the ground in stubborn defiance and lay there for minutes listening to "Come Little Children" and "Go Tell Aunt Rhody" and we called that practice. I wish I could say then that he took to violin right away and that he released his inner pot-clanging and noise-making prodigy and subsequently made beautiful music. I wish I could say that I was the kind of mother who had infinite patience and the knowledge that it would all somehow work out some day. That the process of having my child screech his way through multiple repetitions of "Twinkles" for over a year brought him and me great clarity and greater joy. Nothing could be further from the truth. We kept at it because it gave us a singular, sometimes incomprehensible purpose, to stand still for two minutes in play position or make a good violin bow hold. I still didn’t truly believe the Suzuki adage that all kids were musically teachable. I fully expected us to be the exception that proved the rule. I was happy if after a year of lessons he gained some motor finesse and some focus and could finally learn to tie his shoelaces. I had no compelling visions of him being a violin player. But then we all fell in love. We fell in love with the sound of the violin, its sweetness and richness, its sadness and playfulness. Despite the tedium of "Twinkles," the music CD played on. My son was entranced by "Minuet No. 1" and would replay just that piece endlessly, finally scratching the CD. Once, during a particularly memorable pre-"Twinkle" group class, he refused to follow directions and used his bow like a sword, fencing with another little boy. Finally, he stubbornly sat down and unraveled a string of wool off the carpet. Every child in the room lost interest in air bowing "Mississippi Stop Stop" and begin their own game of unraveling the carpet. On the ride home, I began to compose a resignation letter to our teacher. My son demanded his favorite song and asked me when he was going to play "Minuet No. 1." It was his favorite song, he said, and that’s all he really ever wanted to play. He was tired of "Twinkles." Me too, I said. Me too. 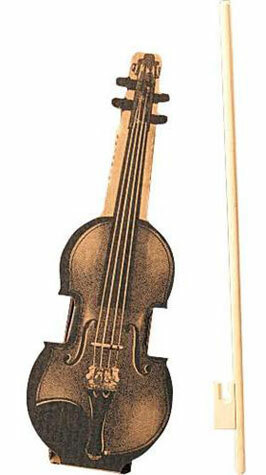 My son eventually did move to a pint-sized violin, the last kid in his group class to lose the box violin. He played "Twinkles" for well over a year, slowly learning to focus for more than two minutes at a time. He played with a squeezing left hand and a right hand that clutched the violin bow in a death grip. But he was playing something and he was happy. I stopped caring about his shoelaces. He never asked to quit, though practices were rarely easy and occasionally conflict-ridden. On a particularly bad day of practice, actually a series of bad days that had ended in tears, my son picked up the violin and bow and began the annoying screeching sound experiments with which he loved to disrupt practice and break my parental will. He would draw the bow back and forth while sliding his fingers up and down the finger board, stopping and starting at random. That day I didn’t have the energy to stop him. I was busy composing my mental resignation letter to Dr. Suzuki for the 100th time. In the midst of the screeching and yowling noises, I heard the first faltering notes to "Lightly Row," a piece he had never been taught. He looked stunned. But hesitantly and then with more confidence he continued to pick out the rest of the song. Soon snatches of other songs followed, picked out by ear. I cried. Just like the CD, he said proudly, I can play the violin. His teacher at the time was unsurprised. The endless listening had done its job. That day changed my view of Suzuki and violin lessons. I believed in my son and his infinite potential. I never again questioned the power of listening to the music, the power of a teacher who believes that our children can do amazing things, or the power of positive belief that can push us through challenges. There are very few things in life that we get to see our kids do over and over again that bring us pure joy. Watching my son struggle and play his way through Violin Book 1 was like watching him take his first steps again and again. It was never taken for granted, always an accomplishment filled with awe and gratitude that we could share the beauty of the music. A year later my son played "Minuet No. 1" by Bach at a recital, confidently and with pride. He could pull music out of his violin, and for now, that was all that mattered to him. He loved the "Minuets," he said, but he really wanted to play "Humoresque" in Book 3, so he didn’t want to stop yet. My son just turned 11 and is still a Suzuki student. Somewhere around "Two Grenadiers," he learned to finally tie his shoelaces. He plays with beautiful tone and focus. He has not encountered a violin challenge yet that he cannot master with practice and effort. His current violin teacher is his hero. He plays in a youth orchestra. He would like to play Bach's "Double Concerto." 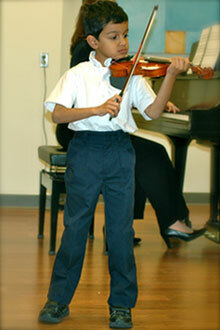 He volunteers to play his violin at nursing homes and at school plays. He sings all the time. He sings loudly in choir, in the car, and in the shower. He will sing with the CD. He sings accompanied by his his hands beating out a staccato rhythm on cooking pots.